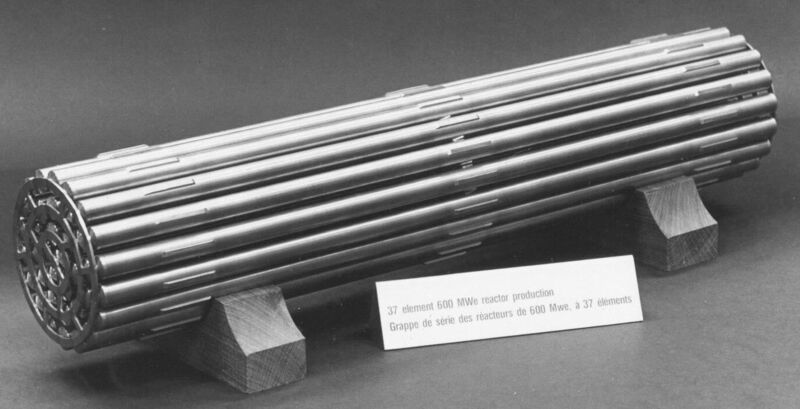 The Gentilly 2 600 MWe reactor 37 element bundle differed from the Bruce 37 in that the end caps were conical to accommodate the fueling machine side stops and the end bearing pads were not staggered. When the Bruce 37 and the 600 MWe 37 were irradiated together, this irradiation was paid for by the Common Programme between Ontario Hydro and AECL. This programme grew into the CANDEV (CANDU Development) programme funded by the utilities and AECL. This was later formalized into the CANDU Owners Group (COG) programme of all the nuclear utilities, this supported and funded common development programmes. The 600 MWe 37 element fuel bundle is been used in the folowing reactors: Gentilly-2, Quebec; Point Lepreau, New Brunswick; Cordoba, Argentina; Cernavoda, Romania; four reactors at Wolsung, South Korea; and two in China.